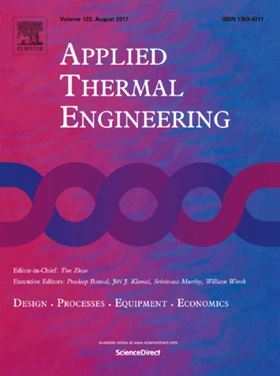 Elsevier journal Applied Thermal Engineering. A gas engine-driven heat pump (GEHP) is traditionally applied for both heating and cooling; however, the cooling performance may be worse than that of an electric heat pump (EHP) because of the waste heat rejection of the gas engine. To improve the system performance of the air source heat pump for the entire year running, a hybrid power-driven heat pump (HPHP) system is proposed, in which the heat pump is driven by a gas engine for heating and by electricity for cooling. The mathematical model of the HPHP system is established, and the performance of the HPHP system is compared with those of GEHP and EHP. It is demonstrated that the primary energy ratio (PER) of the HPHP is 28.5-51.2% higher than that of the GEHP for cooling and 15.8-25.3% higher than that of the EHP for heating. Compared to the GEHP and the EHP, the energy saving ratio of the HPHP is 10.9% and 14.4% in Beijing, respectively, and the corresponding value is 18.5% and 7.3% in Shanghai, respectively. These results highlight the great application potential of the HPHP system for both heating and cooling.